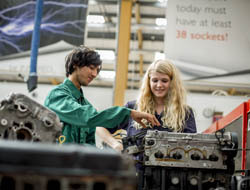 Steve Nash CEO, Institute of the Motor Industry welcomes government recognition that schools must give impartial and well-informed advice about apprenticeship options. Steve Nash, CEO of the Institute of the Motor Industry (IMI) welcomes the government's latest initiative to achieve its target of 3 million apprentices by 2020. In particular, he is encouraged about the plans outlined in the document - English Apprenticeships: Our 2020 vision - to address the current lack of careers advice for 16-18 year olds. "Yesterday's announcement by Nicky Morgan and Sajid Javid revealed the government's commitment to address the current vacuum of advice and support regarding further education options for 16-18 year olds, with a strategy for improved careers provision set for publication early next year. This can't come soon enough. "Currently, with no formal careers advice in schools, young people aren't getting the direction they need to make the best choices for their future. There is a real conflict of interest between schools holding onto 16-18 year old pupils to bolster their funding and the clearly stated desire by government to see more taking the apprenticeship route." Research commissioned by the IMI earlier this year revealed a concern amongst training providers and businesses with training academies in England regarding the Government’s plans to increase apprentice numbers by 2020. FE colleges and businesses believe they will struggle to recruit the numbers and quality of apprentices they need to sustain economic growth over the next five years. Education cuts, poor careers advice, and schools keeping pupils on to maintain funding, are all identified as contributing factors. The survey, conducted by the IMI found that the majority of training providers welcomed the Government's ambition to increase apprenticeships to 3 million but feared other policies will make it impossible to achieve. Seventy-eight per cent of respondents said that careers advice, which has been provided in schools on an ad hoc basis since 2012, is at best unhelpful. Only ten per cent think advice offered by the National Careers Service has any impact on apprentice recruitment. "We feel very positive about the government's stated commitment to ensure young people are inspired and supported to make the right career choices, including apprenticeships", continued Steve Nash. "We are also pleased to see the commitment to an 'employer-led' approach. With the new independent body - the Institute for Apprenticeships - set to regulate the quality of apprenticeships, we think this provides an ideal opportunity for engagement with professional bodies, such as the IMI, to ensure the shaping and delivery of apprenticeships is fit for purpose." The IMI represents the £152 billion a year retail motor industry, which needs 12,000 apprentices a year to stand still.